Allows for some insight into how Wisconsin was settled. No. 1. Sketch of the Public Surveys in Wisconsin and Territory of Minnesota. This is an 1852 George Sargent map of Wisconsin. The map depicts the region from Lake Superior to the Wisconsin-Illinois border and from Minnesota and Iowa to Lake Michigan, Green Bay, and Michigan's Upper Peninsula. Created four years after Wisconsin's became the 30th state, this map illustrates the townships surveyed in Wisconsin. Each township bears a single letter, and this label corresponds to a list of references situated in the lower left corner. 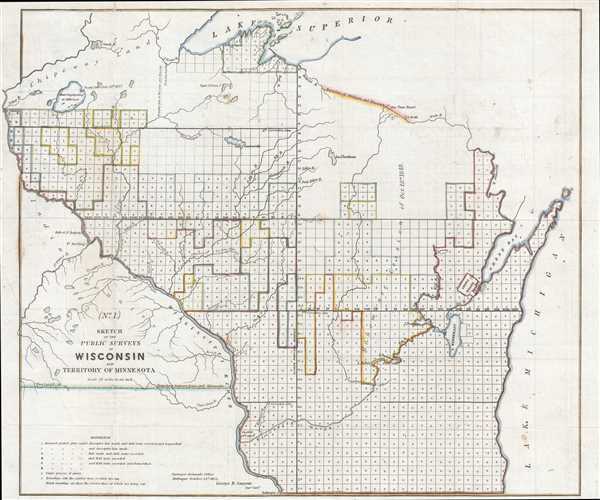 The township was created as the measure of the Public Land Survey System, which was first widely implemented to survey the Northwest Ordinance, of which Wisconsin was a part. The Public Land Survey System allowed for the systematic surveying and mapping of any territory gained by the United States. As stated above, each township is labeled using a single capital letter. These labels indicate each township's status with regard to the cataloguing process of the Surveyor General's Office, which may contain information about how Wisconsin was settled. For example, any township labeled with a 'C' has presumably completed the checklist, meaning that it has been surveyed and platted, the plats have been copied, descriptive lists of the township have been made, and field notes have been recorded and transcribed, meaning that these were most likely the first ones to be settled. Townships labeled with and 'S', however, were only just being surveyed, and townships that are blank only have their exterior boundaries surveyed. These townships would not have had organized towns or settlements, but that does not mean that there were not American or immigrant settlers living in those parts of the state at that time. State borders are labeled, such as those between Iowa and Minnesota and Wisconsin and Michigan. Several rivers and lakes are illustrated, including the Mississippi River (which forms the border between Wisconsin and Minnesota), Lake Winnebago, the Wisconsin River, the River St. Croix, and several other tributaries of the Mississippi. Indian territories are labeled as well, such as an Oneida Indian settlement near Green Bay and Chippewa Lands north of the surveyed territory in Minnesota. A handful of forts are labeled along the Mississippi, and the only town labeled is Dubuque, Iowa along the bottom border. This map was created by the Surveyor General's Office in Dubuque and dated October 21, 1852. It was published in the Report of the Commissioner of the General Land Office, 1852. Report of the Commissioner of the General Land Office, (Washington) 1852. Very good. Backed on archival tissue for stability. Small tear extending three quarters of an inch in upper right quadrant. Writing on verso.